The FDA awarded Magstim, a Carmarthenshire, Wales firm, clearance to bring to market the company’s Magstim Rapid2 rTMS (repetitive Transcranial Magnetic Stimulation) Therapy System. The system is indicated to treat drug resistant major depressive disorder in an outpatient setting. The Magstim Rapid2 has been available to researchers in fields such as cognitive neuroscience, neurophysiology, and rehabilitation. Now the magnetic stimulator will be available in the U.S. as a clinical product. It’s intended to target the dorsolateral left pre-frontal cortex (DLPFC), a region of the brain that sees reduced blood flow in patients with serious depression. When magnetically stimulated, blood flow tends to increase, improving mood and reducing symptoms of the depression. via Magstim’s Repetitive Transcranial Magnetic Stimulation Therapy System FDA Cleared to Fight Major Depression (VIDEO). Google is looking to address the needs of a billion people with disabilities worldwide and it’s putting big bucks behind the effort. As part of the initiative dubbed “The Google Impact Challenge: Disabilities,” the company is also asking people with disabilities to suggest problems that they would like to see addressed with the grant money. Google has already committed funding to two groups — the Enable Community Foundation which links people needing prosthetics with volunteers who use 3D printers to create them at no cost and World Wide Hearing which will use the funds to develop a low-cost kit to detect hearing loss using smartphone technology. “The Google Impact Challenge: Disabilities will seek out nonprofits and help them find new solutions to some serious ‘what ifs’ for the disabled community. We will choose the best of these ideas and help them to scale by investing in their vision, by rallying our people and by mobilizing our resources in support of their missions,” Jacquelline Fuller, director of Google.org, said in a blog post. Alongside the monetary commitment, Google said it will work to ensure accessibility of its own products and add new offerings that benefit people with disabilities. The company cited its work developing self-driving cars as well as Liftware, a utensil designed to help people with hand tremors eat more easily, as examples of its existing work in this space. Advisers for the new project include autism self-advocate Temple Grandin and Catalina Devandas Aguilar, the United Nations’ special rapporteur on the rights of persons with disabilities. via Google Putting Up Millions For Disability Initiative – Disability Scoop. Continue—> The Secret Sadness of Pregnancy With Depression – NYTimes.com. More than just sight is measured in terms of visual acuity, vision is the process of deriving meaning from what is seen. It is a complex, learned and developed set of functions that involve a multitude of skills. Research estimates that eighty to eighty five percent of our perception, learning, cognition and activities are mediated through vision. The ultimate purpose of the visual process is to arrive at an appropriate motor, and/or cognitive response. There is an extremely high incidence (greater than 50%) of visual and visual-cognitive disorders in neurologically impaired patients (traumatic brain injury, cerebral vascular accidents, multiple sclerosis etc.) Rosalind Gianutsos, Ph.D.
“Visual-perceptual dysfunction is one of the most common devastating residual impairments of head injury”. Barbara Zoltan, M.A., O.T.R. “The majority of individuals that recover from a traumatic brain injury will have binocular function difficulties in the form of strabismus, phoria, oculomotor dysfunction, convergence and accommodative abnormalities”. William Padula, O.D. Continue —> Introduction to Vision & Brain Injury. Goto Applications —> OT Cafe: Celebrating OT Month | Apps created by OTs. The Technology section of Disability.gov has a broad range of resources about assistive technology. In addition, we have developed this guide to connect you with programs, services, government agencies and organizations that can help you find and pay for AT. To learn about technology related laws and regulations, including the Assistive Technology Act (“Tech Act”), visit “Disability.gov’s Guide to Disability Rights Laws” or the Technology Laws & Regulations section of the website. Where Can I Learn about the Different Types of Assistive Technology? Where Can I Get Help Finding & Paying for Assistive Technology? How Can Assistive Technology Help Children & Youth with Disabilities? How Can Assistive Technology Be Used at Work? How Can Technology Be Made Accessible? Where Can I Learn about New & Emerging Communications Technologies? Return to Disability.gov’s Guides to Information. via Disability.gov’s Guide to Assistive & Accessible Technologies – Disability.gov. This CE course describes: the known incidence of traumatic brain injury, including trends over time; prevalence of traumatic brain injury-related disability; the adequacy of TBI outcome measures; factors that influence differential TBI outcomes; and the current status and effectiveness of TBI rehabilitation services. via ISSUU – Traumatic Brain Injury in the US – Epidemiology and Rehabilitation by Quantum Units Continuing Education. Mar. 26 – A portable virtual reality device has been developed to help stroke patients recover the use of their limbs. The MindPlayPRO can be used early in the recovery process to trick the patient’s brain into believing that immobilised regions of their body are still working, thereby spurring the recovery to take place. Jim Drury has more. via Virtual reality stroke therapy tricks brain into rewiring itself | Video | Reuters.com. via Traumatic Brain Injury Resource Guide – Research Reports – Study evaluating the effects of Cerebrolysin treatment on clinical outcomes in traumatic brain injury. A first-of-its kind robotic exoskeleton may provide the first glimpse into the future of rehabilitation for people suffering from spinal and neurological injuries. The exoskeleton, dubbed HARMONY, is the result of years of research and development by the ReNeu Robotics Lab at the Cockrell School of Engineering at The University of Texas at Austin. Ashish Deshpande, PhD, and colleagues designed the two-armed, robotic device to deliver full upper-body rehabilitative therapy using natural motion and customizable pressure and force. As a result, the device feels weightless to patients, and allows physicians and therapists to provide personalized, precise therapy and track and analyze data. Unlike currently available robotic devices for rehabilitation, HARMONY encompasses the entire upper body, allowing for bilateral training. 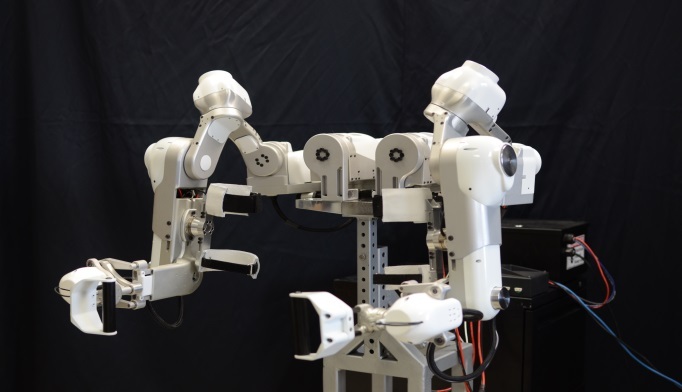 The device, which was created with help from Meka Robotics, connects to patients at three points on each side of the upper body and features 14 axes, which allow for a wide, natural range of motion. Active data collection, which happens 2,000 times per second, is fed back into the device’s programming so that it can consistently provide personalized feedback through changes in force and torque. If a patient’s motion ventures off course, for instance, the device can gently correct that motion. The device is able to mimic key natural motions, including the scapulohumeral rhythm, which could help patients reestablish natural range of motion after injury or stroke. Therapists can also program HARMONY to gradually increase exercise difficulty, and data collected during that process can be used to track a patients’ progress. A trial of the device will begin in June on healthy subjects, followed by a study with stroke and spinal cord injury patients to evaluate the robot’s efficacy compared to that of conventional therapy. In the future, the researchers hope to incorporate a gaming element to the device which could simulate daily activities and help patients relearn the basic motions necessary to complete them. via Robotic Exoskeleton May Improve Rehabilitation After Stroke, Brain Injury.